This Jag rewards a cultured, cerebral approach. It's about what you choose to play, how you attack, and working with, not against, the guitar's personality. Authentic spec. Great garage rock, surf, soul, funk and indie tones. Excellent build quality. £2000 is hefty price for such an esoteric instrument. Those that don't like to fight the fretboard should perhaps look elsewhere. If the Stratocaster and Telecaster are fully paid-up members of the 'one-guitar-you'll-ever-need' club, the popular kids in the playground, if you will, where does that leave the Fender American Vintage Jaguar? "One thing's for sure, not many people are going to drop around two grand on a guitar with niche appeal just for kicks"
Over-complicated, unreliable and proof of Leo's fallibility? Or is it the cool kid that smokes cigarettes, grows his hair long, listens to weird music and turns up late for class? One thing's for sure, not many people are going to drop around two grand on a guitar with niche appeal just for kicks. Serious devotees only need apply here. 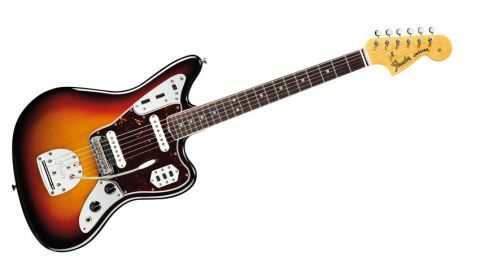 Until the first American Vintage 1962 Jaguar reissues arrived in 1999, from the mid-1980s the only 'new' Fender production versions hailed from Japan. These days, of course, there's much more choice, with a total of 14 Jaguars across the current Fender and Squier catalogues including several artist-signature models, outlandish updates and variations on a theme. "This American Vintage Series guitar may appear broadly similar to reissues of old, but its a very different animal indeed"
Still, those of guitar playing age in the 1990s will remember Fender Japan's Jaguars well. Inauthentic pickup construction, flimsy wiring, unreliable hardware... If this is your frame of reference where Jags are concerned, you're in for a pleasant surprise. This American Vintage Series guitar may appear broadly similar to reissues of old, but its a very different animal indeed. In line with the sharper focus of the other models in the class of 2012, the new American Vintage Jag is zeroed in on 1965 spec. The visible feature that marks it out immediately as different from the '62-style guitar of the previous American Vintage Series is the white binding on the round-laminated rosewood fingerboard with larger pearl dot inlays. In common with its new American Vintage siblings, on removing this guitar from its black tolex case, you are greeted with an instrument that is much less impressionistic than the previous generation of USA reissues and hugely more vintage-accurate and detailed than offshore interpretations or the current Classic Player Series in Fender's catalogue. The sum total of Fender's meticulous scrutiny, refinements and retooling has resulted in a guitar that simply has more personality and a less identikit feel than almost anything we've ever played that's come out of Fender's Corona facility without a Custom Shop logo on its headstock. "The mid 60s C-shaped bolt-on neck is a much more satisfying palmful than the more generic, slim '60s' caricature necks of older reissues"
The mid 60s C-shaped bolt-on neck is a much more satisfying palmful than the more generic, slim '60s' caricature necks of older reissues, with a less linear, more human carve that fattens out considerably from around the 5th fret upwards. It might be too much timber for some, but we're sold after just a cursory unplugged twang. You'll also find the period-correct floating vibrato system - a design that is much maligned, but perhaps slightly unfairly so. We're of a mind that with the right strings and setup, it can be one of the smoothest and most musical vibrato systems out there. For optimum performance and tuning stability, a set of 0.009- or 0.010-gauge strings just isn't going to cut it. This vibrato wasn't designed for light strings and Fender seems to acknowledge that fact by virtue of the presence of a set of flatwound 0.011-0.050s in among the guitar's case candy. "The Jaguar sounds immediately delicious with a vintage-minded playing approach informed by old rock 'n' roll, surf and Spaghetti Western soundtracks"
The Jaguar sounds immediately delicious with a vintage-minded playing approach informed by old rock 'n' roll, surf and Spaghetti Western soundtracks, especially when paired with a 'blackface'-style amp and reverb or slapback echo. Tighter, more compressed amp tones also work well for Motown, choppy funk and Johnny Marr-style pop chord voicings and arpeggios. Wind up the gain and there's no shortage of bite, either, which is perfect for garage rock, 'spy movie'-style single-note lines and early Elvis Costello material. The redesigned pickups have a better-rounded tonality than older American reissue models and are a world away from shrill Japanese incarnations of the 1990s, though admittedly that ought to be a given when you consider the relative price difference. "People will tell you that you can't play lead on a Jag: think again"
The Jaguar's scooped tonality is a stone-cold classic clean guitar sound and the short 610mm (24-inch) scale length makes for easy string bends and bluesy noodling, especially useful when you're wrestling with flatwounds and the 184mm (7.25-inch) 'board radius. People will tell you that you can't play lead on a Jag: think again. Received wisdom and almost the whole of the internet - perhaps even your own experience with lesser incarnations - will also tell you that the Jaguar's rhythm circuit is pretty useless and that the bridge mute is an eccentric throwback of little or no use to the modern guitarist. So why does it sound so flippin' wonderful when you play with both the mute and rhythm circuit engaged into lashings of spring reverb then? Admittedly, pressure from the foam on the mute lever does pull all of the strings just under a semitone sharp, so you'll have to retune to use it in a band context, but it's a great, underused sound that we can imagine being put to excellent use by a thinking man or woman's indie combo such as Arcade Fire or Modest Mouse.